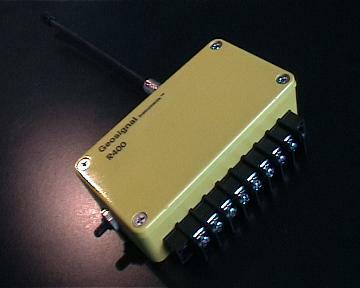 The datalogger R400 has been designed to allow synchronous acquisition from several units not physically connected one to the other. Acquisition in industrial environments with standard industrial sensors like 4-20mA, 0-5V and 0-10V. High speed acquisition from different mechanical parts in movement where no cables are allowed, but the same time basis is required. Monitoring of vibration of mechanical components. 10-bit detailed acquisition 4 times higher than typical 8-bit products. High speed acquisition and multi-point real time synchronous capability. For example: you need to monitor the collision or the simple movement of two moving objects completely disconnected one to the other with the same exact time basis in real time as well. Yes, you can do that by using R400, allowing up to 255 dataloggers to read, store and communicate with the same software at the same time on the same licence free radio band. Not enough! It is possible to program a unit as master unit in order to activate the others on occurrence of an event happening to the master unit. Radio base unit for PC connection. External connection board that grants access to all inputs and outputs. Large Screw connector: 4 inputs plus power, trigger and counter. Sampling interval: programmable from 5000 HZ to one day. Power supply: 3V lithium batteries or external 6V. 254 lines of customisable procedure including some programming. Memory: 1Mbit of Static RAM plus 6800 samples in Flash memory. More than 50 powerful commands including memory unerase.